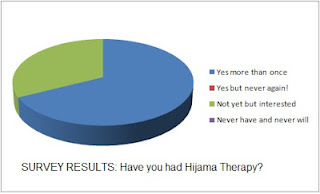 AHEALTH » SURVEY RESULTS: Have you had Hijama Therapy? SURVEY RESULTS: Have you had Hijama Therapy? 117 people took part in the survey, thank you to all who took part. HAVE YOU HAD HIJAMA THERAPY? 1) 67% of blog readers who responded have had hijama, and have had it more than once. 2) 0%, ie there was no-one of the respondents, who have tried hijama, and then never had it again. 3) There are 32% of those who responded are interested in hijama, but for one reason or another have not tried it yet. SURVEY RESULTS: How painful, sore and scarring is Hijama? Additionally, if you haven’t tried hijama because you can’t find a local therapist, you may want to check the regularly updated Hijama Directory at www.hijamadirectory.info for your nearest therapist. Apart from that, any questions or comments about the survey or hijama therapy in general, please leave a comment* below. Thank you all for completing the above survey, and we hope the results will give you a better understanding of hijama therapy, especially if you are considering having hijama therapy for the first time. Any further questions or observations, please leave a comment below*. If you are a hijama therapist or patient and are happy to share your knowledge or experience via a guest blog-post on this blog, please send me an email to: hijama.mail@gmail.com.